At first blush, French Style Furs comes across as another contemporary indie band attempting to channel the briefly abused sub genre of New Wave pop-rock that emerged in the late seventies. But the more you dig into their debut, the three-piece proves there is something bigger happening under the hood. For starters, French Style Furs isn't an upstart but a side project launched by Nathan Willett and Matt Maust (both of Cold War Kids) and their long-time friend Nathan Warketin (We Barbarians). And, more importantly, they stick more to the darker and arty post-punk than the idealist synth pop that overtook it by the late eighties (and indirectly created the need for grunge to refresh rock and roll). In remaining true to the ethos of complex written music and lyrics, French Style Furs creates a tapestry of richly moody and occasionally agitated songs aptly titled Is Exotic Bait. In doing so, they meld experiences from their respective bands, reboot a largely vintage sound, and carve out a new identity. Is Exotic Bait by French Style Furs shakes up some spontaneous creative urgency. The crux of the creative brainstorm was to use the poetry of Thomas Merton as the lyrics. The idea came from Willett, who has maintained a long-time fascination with the mystic and monk. He is well known for his writings on social justice, pacifism, and comparative religion. Willett was especially interested into his thoughts on Eastern religion, but Merton wrote about many topics as a writer and poet. It is the sense of mysticism, perhaps, that gives the album a murky grayness at times. Turn Or Burn is one of them. There is brooding, contemplative quality to the track as it rolls along with a restrained intensity that some Cold War Kids fans will find immediately familiar. Perhaps what is even more interesting to me is that Willett didn't even drop in the lyrics until after Maust and Warkentin had laid down bass and drum tracks. He showed up with a large book of poems and the trio began spontaneously bringing the varied elements together and recording it all as they went. 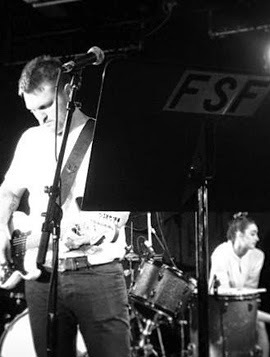 Along with their own work, they also invited Stephen Hodges (Tom Waits) to play percussion on Solitary Life; Haley Dekle (Dirty Projectors), Zina, and Marika Dahlin to raise the reach of Man the Master and Bloodstream, and Nick Kinsey and Wyndham Boylan-Garnett (Elvis Perkins in Dearland) to fill out Clairvaux Prison with some unique horn arrangements. Clairvaux Prison, which closes the album, crosses social commentary with a sense of self-exiled isolation. It also bears the name of a historical monastery that was rebuilt into a high-security prison. While not everything on the album slow burns and smolders, one of the biggest standout tracks is Miami U R About To Be Surprised, which creates a sort of intellectual seduction as it plays out in swirling curls of smoke. It's an artistically wrought thought piece with some beautifully hypnotic foreshadowing. You'll also find the title lyrics tucked deep inside. Other standouts from this addictive abstract include the faster paced and upbeat opener 3 Friends, the frantic musical collage of All The Way Down, the staccato fuzz of (World In My) Bloodstream, and wildly captivating vocals and swaying horns that come together tightly in Solitary Life. While all of these tracks reside on the top of the album, Is Exotic Bait isn't all front loaded. Turn Or Burn rounds out the bottom half, along with the sparsely decorated beat-driven commentary of Man The Master. Some of the other tracks like Ambassadors Of General Electric and Christmas Card don't have the same chemistry even if they are kind of snappy. What they deliver to the album instead is another dimension to what almost feels like a happy accident at times. Is Exotic Bait By French Style Furs Snakes Around 7.9 On The Liquid Hip Richter Scale. Another talent that deserves props on the album is producer Nick Launay. He has long been known for his production work with talents like Nick Cave and the Yeah Yeah Yeahs. He does an exquisite job bringing in lessons learned from both early influencers. Otherwise, the only other bonus worth mentioning is that Maust created the cover art. If you are unfamiliar with his art, make it a point to check it out. It will give you another reason beyond his bass to love his work. Is Exotic Bait by French Style Furs is available from Amazon. It also dropped on iTunes for anyone who wants to download it there. You can also find the vinyl LP of Is Exotic Bait by French Style Furs on Barnes & Noble.